Updated Friday August 25, 2017 by Arizona Outlaws Lacrosse. Ben started playing lacrosse at the age of 14 for the Sherwood Park Titans in Alberta, Canada. He was later recruited to play JR. A lacrosse for the Burnaby Lakers where he played in back-to-back National Championships and was a cornerstone on offense helping the Lakers win the 2000 Minto Cup. Ben was named "Rookie of the Year" (1999) and First-Team All-Star (1999 & 2000). In his two seasons with the Lakers he scored 79-goals/70-assists in 34 games. Ben played Division I lacrosse as a middie for two seasons at Radford University in Virginia (1999 & 2000). In his Freshman year he finished third in team scoring with 24-goals/15-assists in 14 games. In his Sophomore season he led the team in scoring, and finished 4th in the country in goals per game with 36-goals/13-assists in 12 games. Ben helped the Brampton Excelsiors win the 2002 Mann Cup for the Canadian National Championship. He finished second in team scoring in the series with 11-goals/10-assists in 7 games. Ben was drafted third overall in the 2000 National Lacrosse League (NLL) entry draft by the New York Saints. He was selected as the Assistant Captain of the Calgary Roughnecks in his 2nd year as a pro, and played for the Colorado Mammoth, and Edmonton Rush. 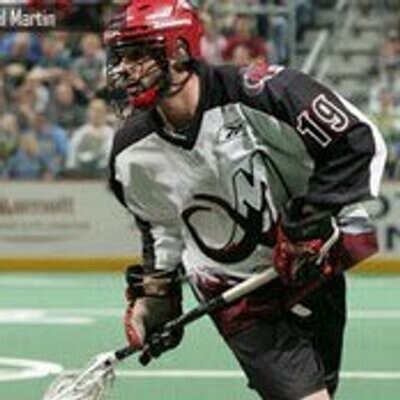 He was a part of the 2006 NLL Champion's Cup winning Colorado Mammoth. Ben finished his professional career with 132-goals/143-assists for 275 points in 99 games.